Police officers need to be aware of how vulnerable they become if they are involved in an incident in which someone is killed or seriously injured – and wait for their Federation representative before they give any statements. Post-Incident Procedure (PIP) is the term applied to the management and investigation of any policing activity that has resulted in death or serious injury, and it applies to all warranted officers. Darren Scholefield, Conduct Lead from West Yorkshire Police Federation, said: “Our colleagues can be so vulnerable. You go out, day in, day out, just to do your job. “But something could happen which would then end up being investigated by the Independent Office for Police Conduct. PIP can affect all officers, so it is vital that they understand the protection available to them, Darren said. He added: “In West Yorkshire alone unfortunately we’ve had death in custody cases, serious road traffic collisions, high-risk, vulnerable, mental health missing persons. The decision to downgrade or upgrade or log can be scrutinised weeks, months, years afterwards if that person unfortunately turns up deceased. “That can be part of a Post-Incident Procedure because they’ve had some recent contact or police involvement. “If you find yourself involved in PIP, go with the process, but don’t say anything until you’ve spoken to the Federation. “We will turn out, we will get you a solicitor – not because we think you’ve done anything wrong but that’s part of the process – and we will help you give your account. “It won’t be straight away while you’re still at the scene. “But it will be during that day and in the couple of days and maybe weeks after the incident. West Yorkshire Police Federation has been at the forefront of training Reps in their roles and responsibilities involving PIP. Representatives attended the national PIP conference in Leicestershire last month to learn from other forces and share best practice. The meeting heard how good PIP procedure can save officers’ careers and wellbeing. 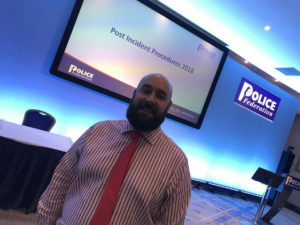 Two Staffordshire PCs told delegates that they were embroiled in an investigation after faulty technology said they were driving at 100mph before a collision. The investigation ensured that they were properly supported and evidence secured that proved that they were clear of any wrongdoing.